Illustration by and © Copyright Anton Emdin 2016. All Rights Reserved. Please do not reproduce without express written permission. Its symptoms—pangs of sad, wistful longing for the past—have become more frequent since I achieved senior citizen status. A few months ago as my squash partners and I walked out of the Hermann Court athletic facility at Wilmington College, I found myself pointing across the street to Austin and Pickett Halls, the interlocking student dormitories that housed the Cincinnati Bengals for 29 summers. I’m a licensed financial professional, but for an all-too-brief span of time, from 1979 to 1983, I covered the Bengals as a reporter for the Cincinnati Post. It was a plum job following an NFL club, especially one that held its preseason training camp in my hometown. 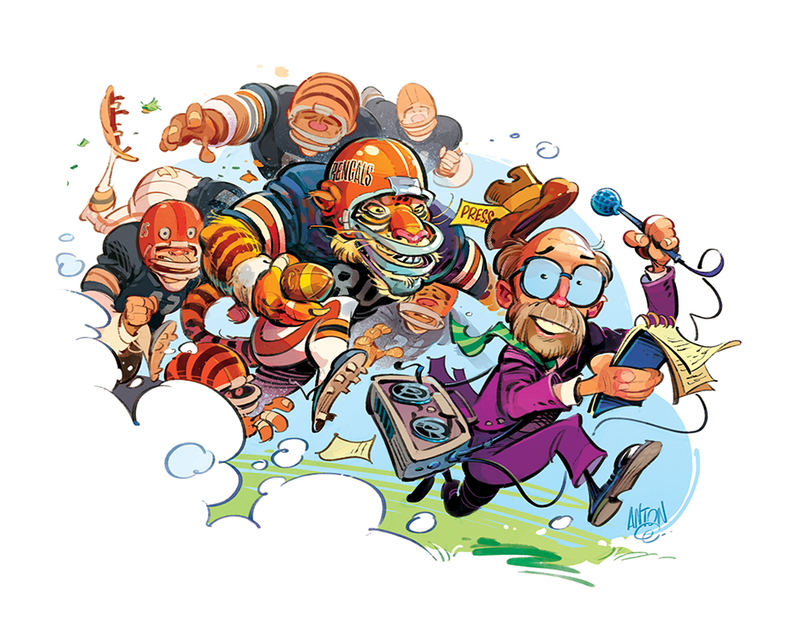 Paul Brown liked to tease reporters, referring to us as ink-stained wretches. Nevertheless, the wretched were welcome to troll the sidelines and locker room at the Spinney Field practice facility. We flew to away games on the club’s charter, stayed in the club’s hotel, hitched a ride on the club’s bus to and from the stadium. The Bengals treated us well, at home and on the road, notwithstanding the hot dogs and baked beans they served in the Riverfront Stadium pressbox every Sunday. I didn’t complain. The team had its ups and downs during my five seasons on the beat. There were back-to-back losing seasons, followed by an American Football Conference title and Super Bowl appearance. There was a strike-shortened season. Coaching changes. Player defections to an upstart league, the USFL. And maybe the most surprising move, Paul Brown’s decision to jazz up the uniform with the organization’s now signature tiger stripes. Hall of Famer Anthony Muñoz came along in the draft, as did two national sportscasters, Cris Collinsworth and Boomer Esiason. I bought my first tape recorder to capture Collinsworth’s colorful, post-game stream-of-consciousness. Boomer, too, was a player who made the job interesting. I remember interviewing him in his dorm room at Wilmington after an underwhelming first week of practice his rookie year, thinking his confidence might be shaken. Instead, he wanted to talk about how disappointed he was to be a second-round draft choice, not a first-round pick. He shrugged off his wobbly, overthrown passes, and with the bravado that would define his NFL career, suggested Ken Anderson might soon be fighting to keep his job. It was pure Boomer. The Bengals spent four and a half weeks at Wilmington College back then, arriving in early July and departing in mid-August. One summer I rode my bicycle to camp, my wife trailing in the car with my duffel bag, a floor fan, a stack of reporter’s notebooks, and one of the Post’s portable tele-printers. I still brag about how swiftly I pedaled the 50 miles from our home, then on the east side of Cincinnati, navigating heavily-traveled Montgomery Road out of the city and pumping my gold Puch Pacifica up the last long grade of U.S. 22 into Wilmington. Was I on a performance-enhancing drug? No. Just young and eager. The players were in no hurry. They practiced twice a day, morning and afternoon, often in smothering heat and humidity. After their evening meal, I watched them trudge across the campus with their playbooks, headed off to classrooms for skull sessions with the coaches. Trudge, defined as: “Walk slowly with heavy steps, typically because of exhaustion.” The rest of the time they were cooped up in a student residence hall with no central air, confined in claustrophobic 16-by-12 rooms, trying to get a good night’s sleep on twin beds. To keep cool, the veteran players taped tinfoil to the windows and propped up portable AC units on folding chairs. Rookies had to scramble or literally sweat out their fates. Curfew was 10:30. Lights out at 11. The professional distance I kept during the 16 weeks of the regular season shrank at Wilmington, where, as an embedded reporter with room and board, I could be mistaken for someone associated with the club. I ate breakfast every morning with the Bengals brass and coaches. During Forrest Gregg’s four seasons as head coach, I skipped lunch most days to play racquetball with his offensive coordinator, Lindy Infante. Gregg summoned me from the sidelines one afternoon to lead the team in his punishing grass drills, hoping the sight of a 5-foot-8, 150-pound reporter doing up-downs would be comic relief for his players. And he was right. I couldn’t pass for a Bengal, but a kid did stop me outside the dorm once, asking for my autograph. Who knows? Maybe in his eyes I was a placekicker. I signed his Bengals cap. The Bengals’ after-hours hangout was the Driftwood Lounge, a cool, dark room in the local bowling alley on the outskirts of town. I usually ended up there after filing my story and notes for the day. The bowling alley’s lounge was off-the-record. Many nights, though, I would receive on-background briefings, if you will, from an assistant coach or staffer. When Gregg halted practice one afternoon with a horrifying roar—“WILL SOMEBODY PLEASE BLOCK THAT GUY!”—and pointed to the Bengals’ 10th round draft choice, nose guard Tim Krumrie, standing over the ball with his hands on his hips, it was center Dave Rimington, the club’s first-round pick, who stepped forward to lodge a complaint against his warrior-like nemesis. Krumrie, he said, was spitting on the ball before each play. Gregg, the former All-Pro offensive guard with the Green Bay Packers, did not buy the slimy excuse. Or so I was told that night at the Driftwood. The Bengals held their pre-season camp at Wilmington College from 1968 to 1996 before moving on to Georgetown College in Kentucky for 15 summers, where they occupied a $15 million athletic complex the players dubbed the Taj Mahal. Townhouses equipped with refrigerators, cable TV, WiFi. Central air! Krumrie, then an assistant coach, feared the team would be spoiled by the luxurious accommodations. “We should all go to sleep in our cars,” he said. Since 2012, when a new NFL collective bargaining agreement shortened camps, the Bengals have stayed home at Paul Brown Stadium—surely more convenient for all parties involved, but not the quiet pastoral retreat Brown sought after the American Football League awarded his ownership group a franchise in September 1967. That fall, when Paul and his son Mike made an unannounced visit to the Wilmington campus, they found what you would expect to find on the grounds of a small, rural school established by Quakers: Peace and quiet. Wilmington reminded Brown of Hiram, the summer home of his Cleveland teams, a place where coaches and players could concentrate. Nevertheless, it may have been a custodian who finally sold the Bengals’ founder on the school. In his autobiography, Brown said he wanted to see Hermann Court, the new fieldhouse adjacent to the football stadium, but its doors were locked. He and Mike were about to leave town when the unidentified custodian, a woman, let them inside the building and gave them a guided tour of its impressive accommodations. Was it Mabel? It was Mabel who ran the place when I was there with the team. The following summer the Bengals opened their inaugural camp, a nine-week marathon. Those were heady days in Wilmington as visitors by the tens of thousands and big-city media came to town to see the team and their legendary coach, already in the Pro Football Hall of Fame, make his return to the game after a five-year hiatus—a national story. Shop owners displayed stuffed Bengal tigers in their store windows. The Wilmington News-Journal reported a run on the 2,500 “Welcome Bengals” bumper stickers, with another 1,500 on order. Brown had to put the brakes on parade plans, telling local boosters it “wouldn’t be right” to ask players to perch themselves on the backs of convertibles and ride through town when the club would be releasing many of its prospects in the days and weeks ahead. I was 16, a halfback on the Wilmington High School varsity, my own two-a-days looming, as Bengals practice got underway on Townsend Field and players started showing up all over town. I remember a group of linemen, one in particular, congregated outside the Dairy Queen. Pat Matson, an offensive guard selected by the Bengals from a list of players made available by the Denver Broncos in the AFL’s special allocation draft, looked like a Greek god with shoulder-length blond hair and a body ripped from the pages of a muscle magazine. Matson would anchor the Bengals line for seven seasons—at 6-foot-1, 245 pounds, a Lilliputian compared to today’s prototype NFL lineman. Half of the 83 players on the Bengals roster at the outset of training camp were dismissed in the first month. Bob Trumpy, one of the survivors, had six different roommates. In his memoir of his 10 seasons with the Bengals, the former All-Pro tight end and sportscaster told of his “grim awakening” upon returning from breakfast on Day 1 to find his bunkmate gone, closet cleaned out. Trumpy, a 12th round draft pick, became so spooked by club officials knocking on his door at dawn and ordering his roommates to report to Paul Brown’s suite with their playbooks, he decided on a bold, pre-emptive, possibly suicidal strike. He would knock on Brown’s door. After Brown invited him into his suite, a suddenly timorous Trumpy asked about his future with the club. Brown, as he recalled, “just sat there without moving,” finally assuring him, in so many words, he had made the team. “I never lost another night’s sleep,” said Trumpy. There were no night terrors on the first floor. I slipped in quietly after curfew, though, as if I were breaking team rules. Paul Brown would fine me. Or worse, send his chief scout, Frank Smouse, to collect my reporter’s notebook. Other than my next day’s story and my farting about with our elusive Mother Tongue, I had little to worry about.